what can gladinet do for me? Gladinet Cloud makes it easy to use online storage services. It support Gladinet Cloud Storage, SkyDrive, Google Drive, Box, Amazon S3, OpenStack Swift, HP Cloud, Rackspace Cloud Files, EMC Atmos, Nirvanix and many other cloud storage services. The solution makes it easy to use multiple online storage services together as if they were coming from the same storage space. You have a Google Drive account, or multiple Google Drive accounts. You have SkyDrive accounts too. Each of these account will give you a special sync folder in your user profile. So, it is not easy to use them all from the same desktop. Most of the time, you would just use one of them such as Google Drive or SkyDrive. You would not use multiple of the service all at the same time. Gladinet allows you to access online storage directly from a drive letter. Inside the drive, you can attach each of these online storage services as a folder for direct random access. You will be adding your online storage services as if you were adding local storage volume. 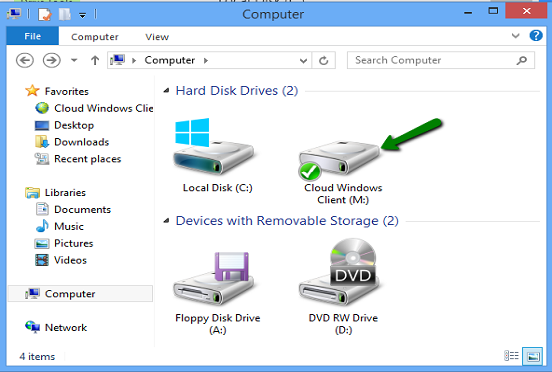 Gladinet Cloud Desktop Client creates a local drive on your desktop PC. You can attach multiple online storage services as folders inside this drive and use them for direct random access to the online storage services. Gladinet Cloud Desktop client makes it easy to use multiple online storage services at the same time. Sign up for a Gladinet Cloud Personal account. After that, you can download the included Gladinet Cloud Desktop client and connect to your account.